It’s not just Theresa May operating with the threat of a leadership challenge. At Bradford City this week, speculation of a takeover attempt has elevated from rumour to the back page. A (legal) coup attempt, headed up by the unlikely pairing of Jack Tordoff and Gordon Gibb. Just when you think the summer can’t get any stranger, this leftfield takeover talk has put the spotlight back on Stefan Rupp and Edin Rahic. 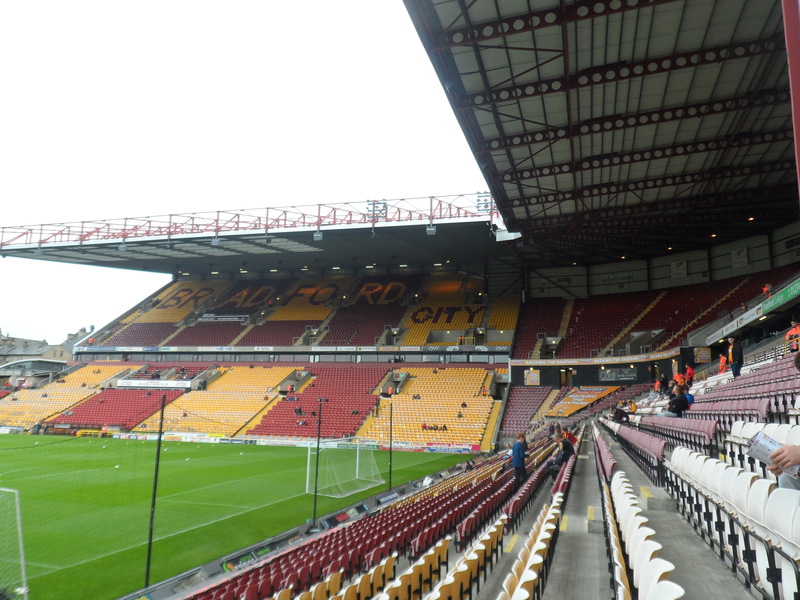 After a difficult six-month period for the German owners, which has seen them come under criticism and pressure from some supporters, an exit strategy of selling Bradford City might appear to be a tempting option. But the noises from within the club have for some time been that there is no appetite to sell. That Rahic and Rupp are fully committed, and have no intention of leaving. It is rumoured that they’ve already flatly rebuffed another approach earlier this year. And whatever your view of Rahic and Rupp, and their strategy that is now firmly embedded going into the upcoming season, it doesn’t necessarily mean this potential takeover bid is right for the club. What expertise do Tordoff and Gibb offer? Would the club be any stronger financially? Do they understand the club better, just because they were born in the county? After all, their business expertise is largely outside – rather than inside – football. It’s complicated at best. Jack Tordoff’s relationship with Bradford City goes back decades. Having left school at 15, he embarked on an apprenticeship as a mechanic working at his family’s business. He later decided he could make better money trading cars rather than fixing them, and established the hugely successful JCT 600 business that has turned him into a multi-millionaire, estimated to be worth more than £200 million. Tordoff first got involved with Bradford City as a director in the 1970s, and his positive influence really grew from 1983, when the Bantams were on the up but over-spending their way to success. In that summer City were placed into receivership, rescued by supporters raising money and a consortium of Tordoff and Stafford Heginbotham, who would return as chairman for a second spell, Tordoff acting as vice-chair. It proved to an incredible ride; the first era of Bantam Progressivism. Under Heginbotham and Tordoff, City were promoted back into the top two divisions for the first time in half a century, and would be on the brink of promotion to the top flight. There was tragedy too, with the 1985 fire. Heginbotham and Tordoff played a vital part in keeping the club together and supporting fans, players and other staff through such a dark period. However, Tordoff’s time running the club will always be clouded by the 1988 transfer fall out. Midway through the 1987/88 ‘nearly season’, Heginbotham stood down due to ill health, and Tordoff became chairman. City were doing incredibly well and in the frame for promotion to the old Division One. Famously, manager Terry Dolan wanted to strengthen his talented but thin squad, by bringing in Andy Townsend and Keith Curle for some £650k. The story goes that Tordoff didn’t sanction the deals, and at the final hurdle City’s stretched squad fell short of promotion. Given City had Stuart McCall and John Hendrie on the books, courting attention from big clubs, signing Townsend and Curle was not considered a gamble to some. The club would be able to more than recuperate the £650k outlay by selling McCall and Hendrie if they didn’t go up. It was a pivotal moment in the club’s history. Had City got promoted to Division One that year, they stood a good chance of establishing themselves in the top flight for years to come. They could have been founder members of the Premier League, when it was launched in 1992. By the time City did reach the top flight in 1999, the financial imbalance of the Premier League meant survival was a tall order, and they were relegated after two seasons. An extra financial push in 1988 could have made a huge difference. We could be talking about a very different Bradford City right now. Post-1988, the club declined and Tordoff and the board sold up in 1990, just as City were relegated back to the third tier. Since then he has been honorary life president of Bradford City, and the shirt sponsorship of JCT 600 has become synonymous with the club over the past two decades. No one should doubt, or underestimate, just how much Tordoff cares for Bradford City. He has been vital to our ongoing existence. A presence we should all be grateful for. But now 83-years-old, just what would he be expected to offer other than money? And is that all we care about? Perhaps the real story is why Tordoff would want to get involved again at this point. Rumours of dissatisfied sponsors have been swirling for months. 2+2 doesn’t always make 4, but is there a link? Where it truly gets complex is Tordoff’s potential partner, Gordon Gibb, the owner of the successful Flamingo Land theme park near Malton. Gibb’s history with Bradford City is chequered to say the least. Like Tordoff, he has rescued the club, appearing on the scene in the troubled summer of 2002, when City were in administration with debts of £36 million. Gibb was just 27-years-old when he agreed a deal with the Rhodes family to jointly buy back Bradford City from the administrators, saving it from going out of business. Gibb was appointed chairman. In hindsight, Gibb was badly guided by those who were supposed to advise him, and did not do enough due diligence. For the 2002 administration was not an end to City’s financial woes, many of the financial headaches were prevalent and becoming more serious. Attendances and sponsorship interest tumbled, seriously impacting on revenue, and the team struggled under the austerity of low wage budgets and no money for signings, culminating in relegation to League One in 2004. By that stage, Gibb had left Bradford City. In the autumn of 2003, he and Julian Rhodes were having to deal with two major issues. They were struggling to keep up with the payments of the £7.4 million mortgage taken out by Geoffrey Richmond, in 2000, to pay for the redeveloped Main Stand, with the lender, Lombards, on their backs. A deal was agreed to sell Valley Parade to Gibb’s family pension fund, therefore removing the problem. As part of the agreement, City didn’t have to pay rent for the first 12 months, and were locked into a 25-year lease. The other problem was that an external review of City’s books found there were significant cashflow problems, and an urgent injection of funds was needed simply to make it to the end of the season. The Rhodes family agreed to pump an extra £3 million into the club, but in return requested from Gibb a greater portion of the overall shareholding of Bradford City. This enraged Gibb, who quit as chairman at the turn of the year. The subsequent fall out led to City returning to administration in February, which they remained in until the end of that year. Gibb’s relationship with the Rhodes family and the club was now so damaged, he voted against a Creditors Voluntary Agreement package that was needed to take City out of administration. In the end a deal was agreed, but since then City have had no relationship with Gibb – meanwhile the ongoing rental payments are benefiting the family pension fund. As part of Gibb’s interview with the Telegraph & Argus this week he claims to have always had the club’s best interests at heart. It is hard to see how this stacks up. Of course, we should be grateful he helped to save us back in 2002; but the frosty relations since 2004 have not helped the club’s efforts to reverse the downwards spiral we were in. After Mark Lawn jointly bought into the club in 2007, he attempted to hold talks with Gibb about buying back Valley Parade, only to be quoted a price twice what was originally paid. In 2011, and with City struggling near the bottom of League Two, Lawn and Rhodes attempted to open a dialogue with Gibb about restructuring the rent agreement so they paid less in League Two, but more if they climbed back up the leagues. Gibb would not engage. There is a common misconception that Gordon controls the Valley Parade ownership debate. He is not the stadium owner, the Gibb family pension fund is. Those who run the fund have an obligation to get the best return for its members, and – for an initial outlay of £2.5 million and some £370k annually for 14 years – they’ve done that with this investment. Nevertheless, Gordon does hold large influence and at the very least could have developed better relations with the club over the past few years. For him to mount a publicity push to buy the club by saying he has always had the best interests of the club at heart does not help his credibility. It is not a good start. Purely speculating, you also have to wonder if his motives to express interest in buying Bradford City include protecting the Valley Parade investment. There’s now officially only 10 years to go until the 25-year lease comes to an end, at which point City could walk away from the stadium and set up a new home elsewhere. That would leave the Gibb family pension fund with an empty stadium. A worthless asset that would be difficult to sell without making a large loss. And with the redeveloped Valley Parade beginning to show its age in certain places, the asking price of the stadium – should City want to buy it back – will start to reduce too. From the redevelopment of Valley Parade in 1986, to 2028, parts of the ground will be more than 40 years old. In player terms, it is a bit like the Charlie Wyke situation. You spend money on an asset, it does well and grows in value, but with the contract situation winding down (Wyke now has less than a year to go on his City deal), at what point does the value of the asset start to depreciate? When is the right time to cash in? Or if not, can you extend the contract so the value is better protected? The Gibb family pension fund needs a Bradford City committed to either buying back Valley Parade, or extending the lease. If Gibb is influencing these future discussions on both sides, the outcome can be more favourable for him. That does not mean this is Gibb’s true intent; the truth is we don’t know. But it underlines the importance of being cautious about this potential takeover attempt, rather than embracing it without challenge. If you agree with Rahic and Rupp’s strategy, you probably don’t welcome this possible approach. If you don’t agree with them, and think the club is in bad hands, you should be even more wary of the intentions and expertise of anyone else who might come to own the club. Just look at Leeds United’s modern history of swapping bad owner with bad owner. Cards on the table, I’ve got concerns about the recent direction of Bradford City. I have yet to be convinced that we are moving in the right way. In my view, Rahic and Rupp still have to demonstrate they have the leadership ability and skills to take the club forwards. But I’ve no reason, as yet at least, to believe that a Gibb/Tordoff partnership would offer better leadership. It’s can’t be solely about money; it’s about the football club we want to be and the strategy for pushing on up the leagues. As the debate about Brexit shows, registering dismay at poor leadership is one thing – but change only really happens by demonstrating the ability to offer a better way of doing things. Otherwise, you’re risking just changing one bad strategy for another. I think we have to give Rahic a chance this season. As we’ll come on to discuss on WOAP over the next few weeks, I think we are taking a very high risk strategy that could go terribly wrong. But this is not the time to rush in and make pre-judgements either way. We have to see how this one pans out. If the worst happens and Rahic fails this season, it will be interesting to see if there are potential other buyers out there. But we should be cautious about any changing of ownership. The club is too important, and fragile. If Gibb and Tordoff are serious about buying Bradford City, they have just as much to prove as Rahic and Rupp. Wow! I wasn’t expecting this news the morning after England’s emotional World Cup exit at the semi-final stage. As many people before have said, it’s never dull supporting Bradford City! I too am very wary and nervous about the 2018/2019 season for Bradford City following the events at Valley Parade over the past six months. The ownership of Valley Parade is very important to our football club and shouldn’t be underestimated. It’s our spiritual home and no one needs reminding about the tragic events of 11 May 1985. Good article and the points about the ground and Gibb’s pension fund interest in it are relevant, i would say as a bit of an alternative view to many people that as the lease runs down, the value of the ground also diminishes, Wyke’s resale value reduces as his contract runs out, so VP’s value to the fund also reduces . Let’s face it , who else would want the land with the well known problems there ? We will reach a point, probably in the next couple years when selling the ground becomes necessary and who else would buy it?? The way I see it is that at the moment it is all guesswork but by the end of September the experiment will have either worked – and we will be top half moving up – or failed and we will be bottom half going down. We all hope for the former and fear the latter. If it’s good news the price will be high and the possibility of a takeover reduced. If bad news, squeaky bum time for Rupp and his investment and probably a desire by him to get out while the going is good. So my question is, why the idea of a takeover now? Is there something we don’t know? A good, balanced article as usual. Lots of pros and cons. Time will tell but I personally feel that we are following a high risk strategy with a high probability of failure. Always easy to criticise the owners, but much of what has happened over the last 6 months or so is not in the best interests of the club or its supporters, I would welcome a return to a more “normal” approach to running an EFL club than this experimental German model. As ever a great article but, in my humble view, very wide of the mark on the VP situation and it’s role in the Gibbs family pension fund. Should we reach the end of the lease, and BCFC walk from VP that would be a god send to Gibb on one view. His current deal secures an annual return that is guaranteed (barring early payouts for leaving) for the next ten years. But paid on a yearly drip basis. Should BCFC upsticks then the Gibb family would rake an immediate fortune for the sale of prime land in the heart of the Asian business community. It’s proximity to Foster Square would offer the opportunity for a daring Asian investor to buy arguably the largest piece of available land in Bradford to add an Asian interest shopping centre within walking distance from main stream shops. Immediately securing the families interests and pot for generations to come. Alternatively, there are existing businesses on City’s doorstep- Tropical Ices to name but one- who may snap the hand off at the prospect of buying prime warehouse capable land. Either way, the VP footprint will be worth millions and millions and may offer less hassle then a yearly rent, and a lot less hassle. Not sure I agree Bertie. Granted its in a prime position, but this is Bradford we’re talking about, not London, Manchester, or areas east of Pudsey. The cost of redevelopment would be monumental. There’s plenty of ‘retail parks’ on Canal Road and the warehousing you suggest would be better sited out of town near the motorway network. Generally I think businesses have numerous options in Bradford without resorting to puling down a large football stadium to build a facility that meets their needs. Potentially the council could buy it and turn it into a ‘City of Bradford Stadium’. Ditch Odsal once and for all. However, we’ve been around that bouy many times before and the thought of Bradford Council having anything to do with Valley Parade sends me cold. From what i’m led to believe the land upon which Valley Parade sits ain’t worth that much due to its topography and location. Didn’t BFG have land valued in the nineties or is my mind playing tricks on me? The Valley Parade site really isn’t worth a lot as anything other than a football ground. The cost of demolishing the stadium allied with coming up with a workable plan for building something else on a slope would put a lot of people off. Even if there is someone desperate to build an Asian interest shopping centre, surely they would go for the easier, flatter (and nearly already cleared) Drummond Mills site. Planning permission would presumably be an issue as the planning authority wouldn’t be keen to take more trade away from the city centre. This is not “prime” land for warehousing either. Prime warehousing land needs to be next to a motorway or other transport links. There’s a similar (to VP) sized industrial site for sale the other side of Bradford at the moment which is mostly clear and is much nearer the motorway and that only has an asking price of £2,000,000. The Gibb pension fund will ultimately be hoping that City buy back the ground at a decent price. No doubt we will see a fair bit of brinksmanship nearer the time of the lease expiring as both parties have plenty to lose and gain. Another fine and detailed insight, which makes a great read and which pulls together a lot that was common knowledge and bits I had forgotten. One issue I am uncertain about is the Gibbs ‘Pension Fund’. Is this a personal/family fund or one for all his employees? A Flamingo Land Pension Fund if you will? I thought that the ground was subject to a protection order put in by the City Supporters trust that the ground could not be used for anything other than football. If that’s the case, the ground has a negative value. The cost of demolition will be greater than it’s worth which as a football only use would be hardly anything. Can someone answer this. I thought the same. One further factor to consider – If this is a fully maintaining lease, BCFC will have an obligation to hand the ground back in the condition that they took it over – therefore they may have to pay money to walk away at the end of the lease, or pay out for repair bills. Back to the matter of ownership of the football club rather than the ground. Whilst I’m no fan of the Germans I do wonder at the motives behind this talk of a buy out. Anyone who’s ever bought a house will know how long it can sometimes take to get the deal done. You can take that and multiply by 10 for a business the size of BCFC. Clearly talk is at the very early stages and no real due diligence can have been done. I fear that talk at this early stage can only be destabilising for the club and a cynic might argue that it’s been designed to hit the news at the very time supporter discontent is at its peak. I don’t like to think of the supporters being manipulated to strengthen a position in a business negotiation. If Jack and Gibb what to buy City then great, do the groundwork, the due diligence, come up with a business plan and then put in an offer. Until then they should pipe down and not try to use supporter sentiment to strengthen their hand. Time will tell. I’m optimistic by nature, think we have brought in one or two interesting players and for once the pitch won’t be an embarrasment. Let’s see what happens. Townsend didn’t want to join City, and Terry Dolan said that Curle was overvalued.